Flights formerly operated by Dobrolet will likely be transferred to one of Aeroflot’s subsidiaries. Aeroflot is to continue operating in the low-cost airline sector, despite the sanctions imposed against its budget subsidiary Dobrolet, according to statements made to RBC by the company's investors, as well as several Aeroflot representatives. The company is thinking of bypassing the sanctions by giving the Dobrolet business to a new or already existing daughter company. According to an Aeroflot representative, the low-cost model has considerable potential for the Russian market, and Dobrolet's "successful start has confirmed this estimation." According to him, a decision concerning development plans will be taken in the upcoming months. One of the possibilities is to base the development of the low-cost program on one of the company’s functioning affiliates, for example OrenAir (Orenburg Airlines), say RBC sources. 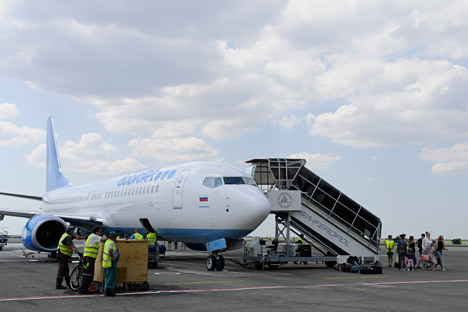 OrenAir will cover destinations served by Dobrolet, meaning that passengers who have already bought inexpensive Dobrolet tickets to Simferopol and Volgograd will be able to fly with OrenAir, stated an Aeroflot representative last week. Starting in mid-September, OrenAir will continue flying to Dobrolet destinations, but charging its own tariffs, said an RBC source. Additionally, Aeroflot plans on giving OrenAir two Boeing 737-800 craft, the model used by Dobrolet. The company's board of directors will examine this issue on August 25, Aeroflot announced on August 14. Dobrolet has spent almost $2 million on insurance for its fleet of 16 new Boeing 737-800 airliners, which the company intended to buy by 2017, according to RBC sources and an Aeroflot representative. Dobrolet has signed a memorandum with Boeing about its intentions and paid a deposit. This deposit, however, is refundable if the company refuses to buy the airplanes, says a Dobrolet representative. Out of the eight airplanes contracted to Dobrolet, half have been registered to Aeroflot (they will be supplied and redistributed within the group). The other four planes, which have been registered directly to Dobrolet, will not be supplied, said the representative.